Cannot help but feel kind of ashamed having to blog about our ordeal last Friday, but I believe it may help others next time. The photo below of Stacci, could have jolly well been the very last photo we took of her. We always think that Singapore is a nice and safe country to live in (which it is), but that doesn't mean that bad things will not happen here. One of the most terrifying thing that could happen to any parent, happened to us last week. We lost our child. We lost Stacci. 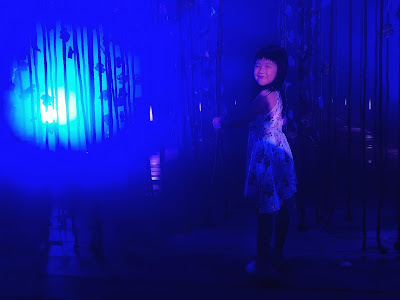 We visited the Zoo late in the evening for an event and the very comfortable bus journey from Mandai back to Ang Mo Kio lulled the 4 kiddos to sleep. We did manage to drag them to Burger King at AMK Hub for a late dinner (or should I say, supper) and were happy to make our way to the bus interchange for our bus back home after that. The kiddos were not too happy since they were really sleepy by then. We made our way up this flight of stairs and walked towards our bus berth for our feeder bus after the meal. I was walking in front, with the assumption that everyone else was just right behind me (and they should rightfully be), when my wife suddenly asked where was Stacci. Confident that the lazy girl must have just been lagging behind since we were barely 20 meters from the entrance, I walked back to look for her. But she was nowhere to be found, and my wife got a little hysterical when she found me walking back without her. She asked if we should make a police report, to which I answered that we should still try to find her first. I must have seen too many dramas, to imagine that there was a 24hr requirement before a missing person report can be made, like in the movies. So we ended up walking back and forth over the same stretch of road from the stairway to the interchange multiple times. The logical me cannot reconcile the fact that she simply disappeared into thin air, when we still had our eyes on her barely minutes before. That was when all the bad thoughts of what could have happened to her came to my mind. I wasn't going to take any chances and I called the police at 11.39pm, providing them with whatever details I had. 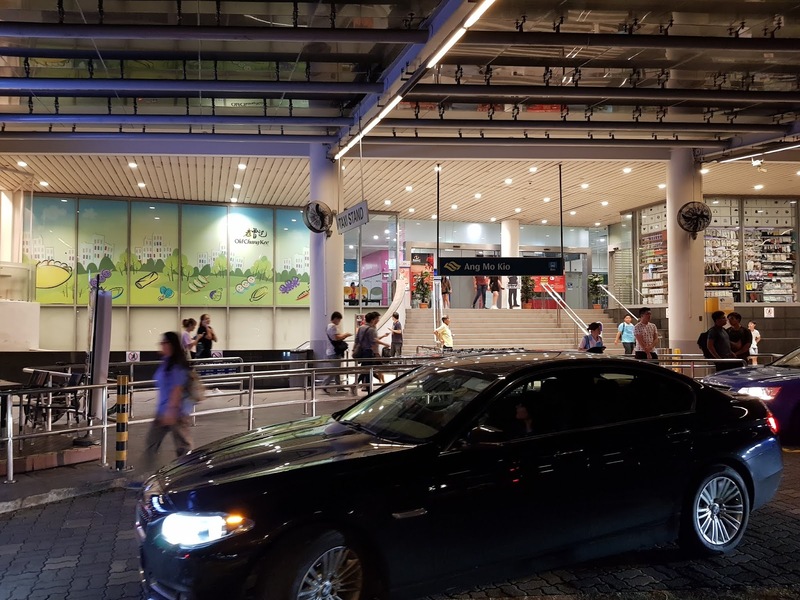 We also approached the mall security to request for them to check the CCTV footage because the customer service was closed by then, only to realize that certain coverage belonged to AMK Hub, while the others covering the interchange fell under the purview of the bus interchange. In desperation we also request help from the bus captains, who probably broadcasted the message out to the rest of the fleet. Now in what seemed like eternity, we felt totally helpless. From searching for her quietly by ourselves, I started approaching passerbys to ask if they had seen her, and finally ended up shouting her name out loud. I can feel everyone's eyes on us as we shouted like mad persons, but it doesn't matter anymore. We just wanted her back. Then it happened. First a young couple came forward and asked if we needed any help, and we exchanged numbers. They said they will walk around and help us search. We exchange numbers and I sent them a recent photo of her. They did not have to, but they did. Then another auntie walked up to me, and asked for more details. She gave me a tap on my shoulder and said she will look for Stacci as well. 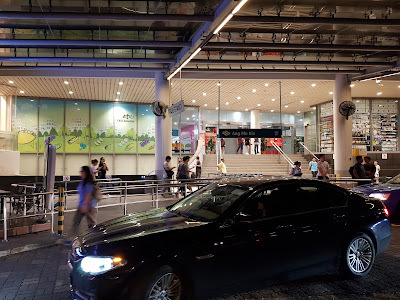 Yet another Indian auntie came forward, and advised us to approach the security to help, showing her concern as well. They needn't have to but they all did. We continued to search around the vicinity to no avail, till a bus captain approached us and mentioned that a little girl had just been found one bus stop away. As I brisk walked to the bus stop with the bus captain, I cannot fathom how she made her way to bus stop on her own. I could already see a small crowd from afar as we approached the bus stop opposite Big Mac Centre. I was so relieved to find Stacci in the arms of a lady, who was cuddling her tight. Stacci was both tired and scared, and took a full minute or two before coming to the realization that it was me in front of her, and finally acknowledging me. It was then I found out from the lady and her family members that they had found Stacci looking distressed on the bus they were on. She was also unable to answer them coherently when questioned and that was when they approached the bus captain for assistance and decided to stay with her. As luck has it, 3 policemen were crossing the road, right in front of the bus and the bus captain honked at them to stop. The kind family alighted at the nearby bus stop together with Stacci, and reported the incident to the policemen. Meanwhile the bus captain went on his way, but not before reporting to his colleagues, who then pieced the puzzle altogether. By then, another 2 police cars pulled up and I was interrogated by a total of 7 policemen in a circle as I held her tight in the center. I was so happy that I wanted to take a welfie with all of them but understandably they declined. Do not panic. Easier said than done, but it helps heaps! Check if there are any CCTV cameras around. Approach the right authority for help in reviewing the footages. Retrace the steps and do not hesitate to ask for help. Shout out your kid's name too. Time is crucial, do not be like me. Call the police if you feel that something could have gone wrong. There is absolutely no time restriction on making a lost person report. The young man who helped with the search, who actually found a shoe belonging to someone else. Thank you! I am so thankful to all the kind souls who came forward to offer help to us and I had also thanked all of them profusely. It is so amazing and heartening to know that kindness is well and alive. Being the recipient of such kindness by total strangers, I know how every little bit helps and the difference it makes. 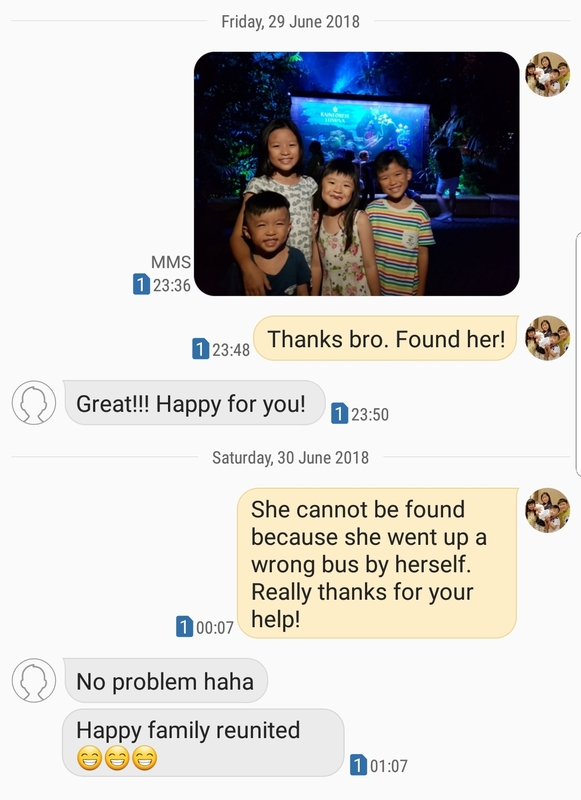 Thank you to all the bus captains who went out of their way, the couple and auntie who went round searching, all the policemen who responded that night, the family who stayed with her till I reached (and had to wait for the next bus) and to everyone else! Once again, if you are one of the strangers who helped on that fateful Friday night, please accept my sincere thanks! This imperfect father will promise to do better the next time! Full Day Family Fun on Sentosa!